Such a silly name for a beautiful boy. Daisy is the saviour I crave and the safety I haven't felt in years. My world is spinning out of control but he's the salvation that can keep me alive — if I'll let him. Two random meetings, nine emails, four days and a broken boy that brought me back to life. I tried to persevere with this book but it just wasn't for me. I sometimes felt that although the characters had been though some bad things, their lack of maturity showed in how they dealt with things and everything seemed to happen so quickly. 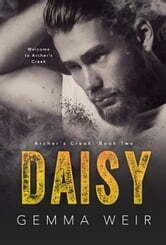 Angel just seemed to accept that she was Daisy's property, moving from one sheltered life to another. Daisy as a character was great, although at times he came across as a hot head, he does genuinely care for Angel, but again if the book was set around people who were a little older with more emotional development. I think I would have enjoyed this book more, especially when it came to the ending and Angel's depression. An okay read. Sweet love story you find yourself rooting for their love and get to follow as she becomes stronger emotionally. Following the path they go on together was a lot of fun. Love Gemma. She writes so well. The characters come to live and are so likeable. Daisy and Angel are adorable together. Can't wait for Gemma's next book in this series. Thanks Gemma.